It has become popular in our day to rewrite history by renaming things. In some states, schools formerly named after George Washington or Thomas Jefferson now bear names like Clifford Jervis Elementary School or Alvin D. Ridgeway Middle School. Residents objected to the historic names on the grounds that founders of our country who owned slaves are unfit models for American children. The new names typically belong to local civil rights leaders or politicians. Elsewhere, the Civil War is still being fought with names. In Virginia, where I live, a furious battle is going on over renaming bridges, highways, parks and streets because they are named after Confederate heroes of the “late unpleasantness.” Jeff Davis Highway (U. S. Route 1) which runs through Arlington County is a prime target. Following some controversial name-changes and contentious incidents surrounding removal of Confederate statues, the Virginia Legislature passed a bill in 2016 that would have prohibited cities and counties from removing war memorials, including Civil War monuments that recall the South’s history. Governor Terry McAuliffe vetoed the bill, however, so the battle continues. 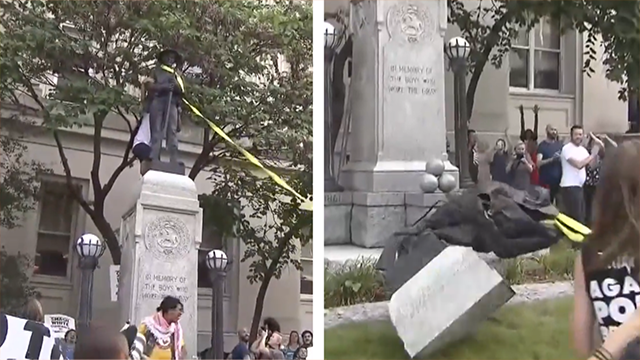 Confederate monuments have been removed or defaced across the South. But the “historical purging crusade” has touched more than statues and names. In 2000, alumni of Wheaton College – the Evangelical school from which I, my daughter, and my son graduated – victoriously concluded a long vendetta against the school’s sports mascot, the Christian Crusader. The mounted Crusader (with armor, shield and lance) was denounced as “offensive in today’s diverse culture.” Influential alumni said they were embarrassed to wear a sweatshirt bearing the Wheaton mascot when they met Muslim friends. I was glad that former Wheaton President V. Raymond Edman – a godly man and a World War I veteran – was not alive to hear those ignorant slanders. Dr. Edman’s five sons served in World War II – one of them in the Omaha Beach landing. He was extremely proud of his family’s service in the cause of saving Christian civilization in two great wars. He often spoke of it in chapel talks when I was a student. Dr. Edman always identified Wheaton with the noble ideal of the Christian Soldier. I wondered what those squeamish alumni thought of their “Religion of Peace” friends after the 9/11 attacks. Did anyone regret trashing the Wheaton Crusader? Wheaton’s gymnasium – which in my time was dedicated to an alumnus described simply as a “Soldier, athlete and Christian gentleman” – was renamed in 1968 to honor a long-time Wheaton coach. At a time when the Vietnam War was being noisily protested by Wheaton students, was the renaming done to distance the college from its former “war-like” posture? I don’t know, but I suspect it. Closer to home, the pastor of a Baptist Church we attended here in Northern Virginia wanted the church to remove “Baptist” from its name. He claimed that it offended many residents within the church’s proximate territory, and called it an “unnecessary obstacle” to reaching people. He also swore (on a stack of Bibles) that the church would never swerve an inch from its identity as solidly Baptist and Evangelical. I didn’t doubt that the pastor meant this, but I also didn’t care for the name-purging. Not wishing to make a scene by opposing him, we skipped the congregational meeting convened to decide the issue. Besides, we were new to the congregation, and thought it wasn’t right to join an argument about a name-change. I’m a lifelong Christian, but not a lifelong Baptist, so I have no emotional ties to the Baptists. We attended that church because it was Evangelical and was near our home. I was raised Evangelical Congregational; attended a Wesleyan College; was a Wesleyan for a time; became a Presbyterian, then a Baptist. Now I’m an Anglican. I don’t agree with all the theological tenets of any of them, but I remain conservative and Evangelical in my beliefs. Respect for the past. 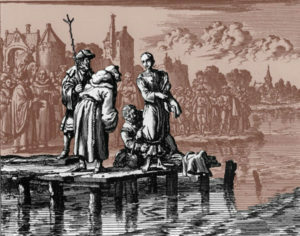 Today’s Baptists – of whatever denomination – are spiritual descendants of the Anabaptists of the 17th century, who believed that Infant Baptism – as practiced by both the Roman Catholic and Reformed Churches – misled a person about his salvation. They taught that a believer should make an adult declaration of personal faith and be re-baptized. Their model was John the Baptist, who baptized adults, not infants. For this “heretical” teaching, the Anabaptists were horribly persecuted by both Catholics and Reformers. (Standard punishment was execution by drowning.) The Anabaptists’ courage and faith live on in Baptist tradition the world over. Modern Baptists are also brothers “under the skin” of the Amish, the Mennonites, the Hutterites, and the Brethren in Christ –sects that arose directly out of the Anabaptist persecution. The Anabaptists were about more than baptism, but this was their point of greatest conflict. Some of them died for their faith. It’s important to honor and embrace their sacrifices by holding onto the name Baptist – not discarding it like some old rubbish someone thinks doesn’t smell good any more. Any denomination or sect with an honorable name and tradition deserves that respect. Steadfastness. As noted earlier, our culture thinks anything can be renamed, redefined or reordered to suit modern fads. Thus, in Isaiah’s words, we “…call evil good and good evil.” Lately, a radical cabal has succeeded in redefining marriage, via the courts, to include homosexual perversion. Christmas is a forbidden term in polite discourse. And the name Jesus Christ is now considered too offensive for schoolchildren’s ears (save as profanity). In such a time, it is more important than ever to remain steadfast – to stand by the old names, the old words, the old songs, the time-honored beliefs. A Baptist Church – love it or hate it – is a defined quantity with ancient and honorable origins. If ignorant modern people don’t know that, then we need to educate them – not validate their ignorance by countenancing name-changes. Remembering that we’re Americans. Americans are probably the most tolerant people on earth. We allow all kinds of beliefs and behaviors to swirl around us – sometimes to the point of absurdity. “Live and let live is a central facet of the American character. But this easy-going attitude sometimes tempts militant factions to excess in their demands. They push, agitate, threaten and knock people around until they finally run into another key part of our national character: we don’t like being pushed around. When extremists’ demands and actions begin to intrude on our rights and way of life, we push back. This often evokes shock and outrage from parties who thought we were simple rubes who could be hustled on anything. That pushback is forming up on the renaming and historical revision campaigns – leading to confrontations and violence in some cases. Our equable inclination to be polite, considerate and tolerant has caused some of us to forget that we became an independent nation because we could be pushed only so far before we fought back. We need to remember that. The Slippery Slope. Modern social analysts mock the Slippery Slope idea. They say it’s nonsense, but they are mistaken. Our culture is clearly on a rapid slide that might not be stoppable. The slope is post-modernism, a seductive mare’s nest of thought and behavior in which all morality, law, and truth are considered local – meaning individual. All cultures (and religions) are called “morally equivalent,” and we dare not judge one over the other. Law is entirely mutable. Every man does what is right in his own eyes. In this morality-maelstrom, the Church is vulnerable. Abandoning a historic name of great honor and tradition will instantly signal to people around us that we are aligned with them in post-modern culture, where everything is up for grabs. I dispute, in the strongest terms, that such cultural solidarity is valuable for the Church. Is the name Baptist really an obstacle to reaching people in our community? Perhaps. But personally, I’m not buying it. People who want nothing to do with church will give any excuse for staying away, including uncomfortable pews, unfashionable clothing, unhip music, substandard coffee and hypocrites. (The latter two actually mentioned in the Dead Sea Scrolls, I believe.) Are we really so gullible as to take these seriously? After we have sacrificed our historic names so people will like us, can we expect to retain the substance of our Faith? How shall we resist when our new “friends” insist that we lose the offensive Cross? What shall we do when they say the word Church is “unacceptable,” or when they declare the Savior’s name unfit for the ears of children? Of course, we shall never cave on these “important” issues. But are we sure? Is caving on a name really a good rehearsal for standing firm on the bigger issues ahead? 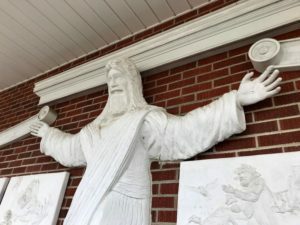 Recently a Baptist Church in South Carolina took down a statue of Jesus that some members called “too Catholic.” That’s not a good sign. As a Christian I believe the Church should rise above the culture and be a counter-cultural agent. Baptists should embrace their own history as a positive force for proclaiming the Gospel and bettering our society. They should respect the sacrifice and devotion of believers who marched before them, just as Americans need to keep alive the names of the great men who served our country and gave us what we have. A familiar hymn says: “They like a mighty whirlwind’s breath swept on every field. The faith by which they conquered death is still their shining shield.” Baptists marched in that company of Soldiers of the Cross. They still do. The world is richer and better for having had them. And Americans all around them need to see that name and know who they are. That goes double for our culture, our country and our Faith. We need to hang onto those names and understand what they stand for. 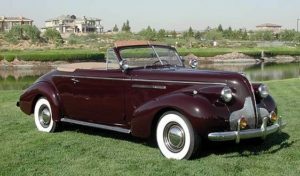 Not everyone drives a Buick, but their cars have always been of high quality, and you don’t see them changing their name.